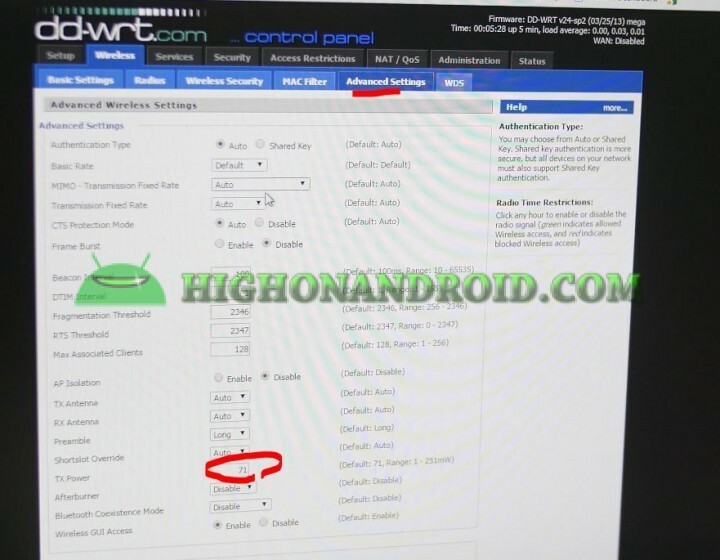 How to Super Extend Range of your Android WiFi Hotspot using DD-WRT! The other day my Comcast Business internet went down again, that’s the 5th time it happened and my download speeds crawled to around 1Mbps download for couple days (while I paid around $200/month for 100Mbps). On those days, I usually tether my main office computer to my Verizon Note 3, which I have an unlimited grandfathered plan. Now, in most cases you can easily tether off your phone without a problem if you get good download speeds everywhere in your house. Well, in my case, the best download speeds for Verizon 4G LTE is actually in my outdoor tent. But if I put my phone there, I can’t tether that well from everywhere within my house because there are walls and other things blocking the signal. 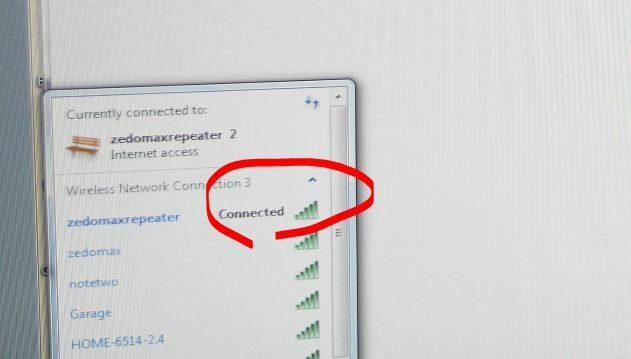 So, how do you extend your WiFi hotspot signals so you can use it everywhere in your house? The answer is rather simple, you can use a WiFi repeater. 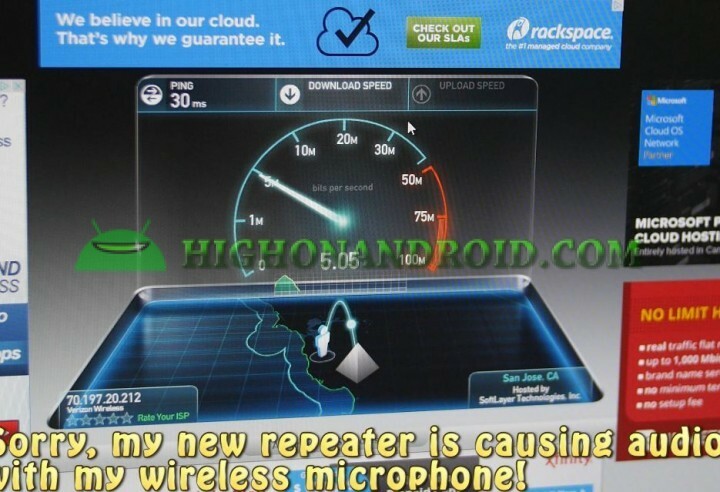 A WiFi repeater, as its name implies, simply “repeats” wireless signals. Now, you can buy these WiFi repeaters on Amazon but the problem is that they don’t work that well, the range is pretty bad. A better way to approach this is to make your own custom DD-WRT router and put it into repeater mode. This way, you can hack the router and increase the transmission levels just the way you want it. I had a bunch of old Linksys E1200s lying around so I decided to recycle them into an Android WiFi repeater. These are actually much cheaper than buying WiFi repeaters so you get better repeaters and save money at the same time. You can also use any type of routers that support DD-WRT firmware (you can check it your old router is supported here). 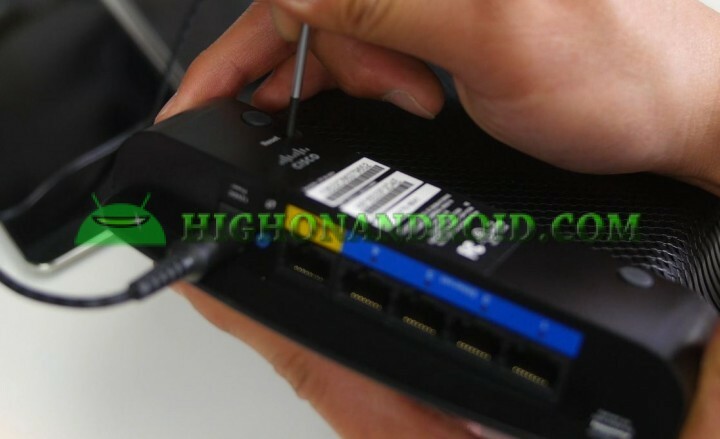 Also do make sure the router you want to use as repeater supports the type of wireless you want to repeat such as Wireless-N, Wireless-G, etc…etc.. The E1200s are great because they support both N and G.
Step 1. First thing you will need to do is to install DD-WRT firmware on your router. You can refer to my video tutorial I made few years ago or you can also check out DD-WRT’s howto pages. The process is actually pretty simple, you just download the DD-WRT firmware and load it with your router’s existing firmware upgrade feature in most cases. Step 2. Once you have installed DD-WRT firmware, you are ready to go. 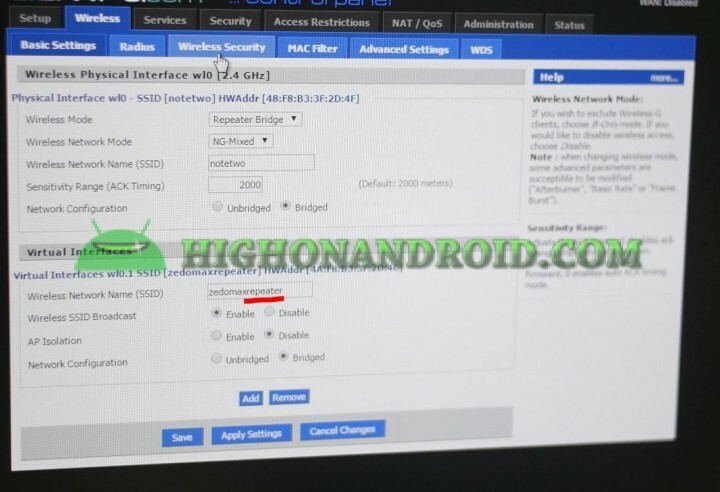 First, you will want to set a network SSID on your Android smartphone, set security to “WPA2 PSK”, and password. Set your SSID to something easy to remember as you will need to re-type it for your new repeater settings. Also make sure you use all lower cases if possible as repeater is case sensitive. Then turn on your WiFi hotspot and put it in a location in your house that gets the best download speeds (you can use SpeedTest app to test your speeds). Step 3. Next, you will want to do a hard-reset on your router. Most routers will have a hard reset button somewhere on the back, just hold it down for like 30 seconds. Step 4. Go to your computer, connect to “DD-WRT” wireless connection, (or you can also do on your phone or tablet) and type “192.168.1.1” in the URL of the browser. You will probably see the following screen, set your router username and password. Step 5. Go to Wireless->Basic Settings. 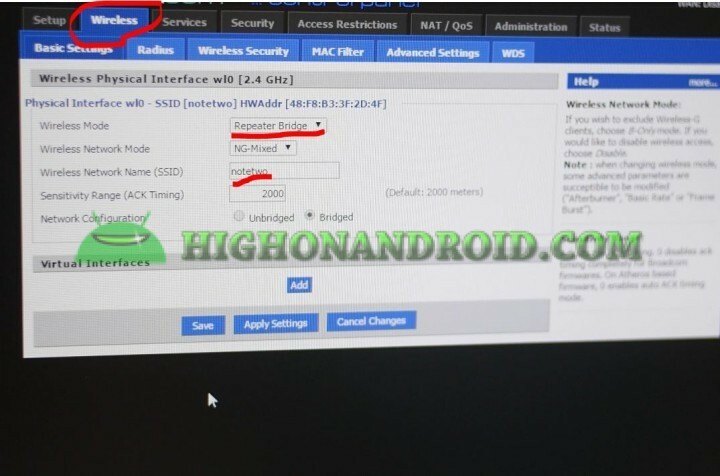 Set “Wireless Mode” to “Repeater Bridge”, set “Wireless Network Mode” to “Mixed” or whatever signal you want to repeat, and set the SSID to the same SSID you set on your Android WiFi Hotspot. Then hit “Save”. Step 6. Next, hit “Add” under “Virtual Interfaces” and set a new name for your new repeater. In my case, I named my new repeater “zedomaxrepeater”. Step 7. We are almost done, go to Wireless->Wireless Security then set Security Mode for all to “WPA2 Personal”, “WPA Algorithms” to “AES”, and “WPA Shared Key” to same as your WiFi Hotspot password. Then hit “Save”. This is also the password for your new repeater so remember that. Step 8. We have to disable firewall since it will interfere with our new repeater, go to Security->Firewall, set “SPI Firewall” to “Disable” and hit “Save” at bottom of screen. Step 9. If you want to access the router later on, you may want to also enable the web GUI, so go to Administration and set “Web GUI Management” to “Enable”. Step 10. Here comes the fun part where you can manually increase the transmission power of your wireless signal. Go to Wireless->Advanced Settings and set the “TX Power” to around 180. This will increase your repeater’s signals by more than twice so you can repeat/extend the range of your WiFi Hotspot to the maximum! Step 11. When all is done, double-check everything is done correctly and hit “Apply Settings”. This will finally apply everything you set on the router and start the repeating mode. Step 12. Give your router about 5 minutes to reboot then try connecting to your new repeater. If it doesn’t connect right away, try resetting the router then try again in 5 minutes. If your computer doesn’t connect right away, let it sit for 5 minutes and try again, it will eventually connect. Your internet should be working. If not, you may have done the settings wrong. Step 13. Once you have it repeating your WiFi HotSpot, now you can tether off your Android smartphone from anywhere in your house with decent speeds. Try placing your WiFi HotSpot at a midpoint between the furthest point in your house and your Android smartphone. This way, you extend your wireless signal as much as possible. If you cannot get it working the first time, don’t worry (it took me about 3 tries), just start over from Step 1 and try couple more times until you get the hang of it. Once your repeater starts working, it will never stop working. Thanks for the kickass tutorial. I’ve followed this twice successfully; however I can’t seem to figure out why the network is unprotected. I also can’t figure out how to access the admin once I’ve applied the settings. For instance, I did this the first time and realized there was no password. I had to do a 30/30/30 in order to access the admin to run this tutorial again. Once complete; no password again. Any ideas? Two things you forgot to mention. The router must be first set to the same WiFi channel as the hotspot. The problem is some phones are set to auto and you can’t change this. The phone will switch channels if the channel it’s on gets too crowded. The router itself can cause the phone to switch channels, so router should be switched on after the phone hotspot is switched on. Second point, the gateway address must be set. This should be the IP address of the hotspot. Otherwise there will be no internet. David, any chance you could weigh in on my situation below where I commented that my repeater is wide open and not password protected? I could really use the help! Thanks for any help! Greg, so in the wireless security tab you select the security mode ‘WPA2 Personal’ for example. WPS Algorithm AES. And then put a password in the WPA Shared Key field. Then hit ‘apply settings ‘. It should be that simple. 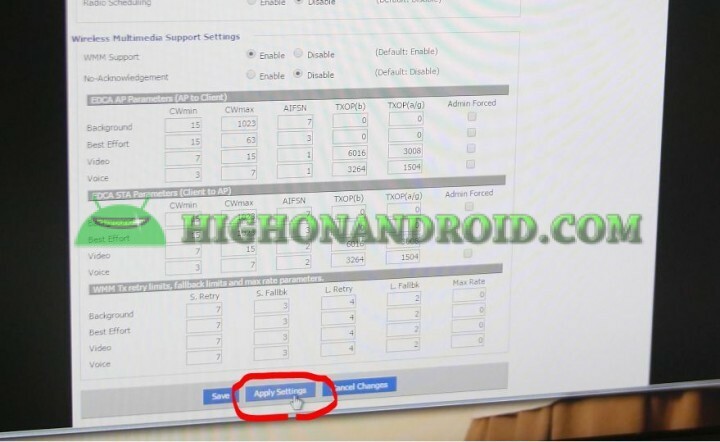 Previous story How to Install Flash Player on Android Lollipop!